And so I returned to my regular life, feeling that strange glow of satisfied exhaustion. It's a funny thing to straddle time, and that's certainly what it felt like, going back to my old university. While my head was in a place that's 20 years behind me, my body was moving through the school as it is now, still very much alive and well and filled with all manner of possibility. In the wake of my visit, it was suggested more than a few times by more than a few people that I ought to consider teaching. I've pretty much hit my goal in magazines--I have no desire to be an editor in chief, nor to climb any higher up the masthead than I am now. I'm already too far from everyday writing and editing for my own comfort. But aside from a vague idea about writing books, I haven't really given much thought to what the next step in my working life might be. Now, I'm thinking, Maybe teaching is it. My return home was heralded with the usual craziness and tumult. I was only gone a couple of days, but you'd have thought I'd been missing for a month, the way the kids carried on. Even the Eclair at first seemed like she didn't recognize me, but when she did, she warmed up and wanted me to carry her everywhere, patting my arm and making goo-goo eyes at me as she did. Thomas didn't sleep well while I was gone, and said so. "I had weird dreams," he informed me my first night back, as I was tucking him into bed in his loft. "Oh, weird stuff. I dreamed I was sleeping in a bunk bed with Uncle BB on the bottom and I was in the top bunk under the covers, reading." And I gave my son a funny smile as he produced a small flashlight and a stack of comics. "So I tried it." "You've never read comics under the covers with a flashlight?" I asked, more amazed at myself than anything else that I had never introduced my son to what I consider to be one of the great joys of childhood. Hell, of adulthood. "No," he said, shaking his head. "But in the dream, I was doing it while Uncle BB was snoring below me. And I had a little blue light instead of this one," he said, waggling his yellow flashlight. At this I froze. "You know," I said. "I used to have a little blue penlight when I was a kid. In fact, I used it to read comics under the covers. While Uncle BB lay in the bunk below me, snoring his head off." "Cool!" said Thomas. "Hey, maybe I was dreaming I was you, like I was back in time." The same thought had occurred to me, only I wasn't quite as enthused about the idea as Thomas seemed to be. In fact, given my recent ruminations about going back in time, the coincidence was downright eerie. I shook it off. "Well, if you're going to read under the covers, you have to do it right. 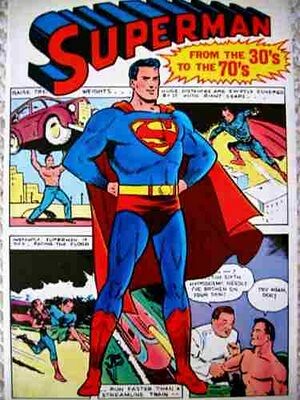 When I was your age, I spent all of my birthday money on a giant book of Superman stories which had his first appearance and a ton of cool stories from the 30s on up. And that was my favorite book to read under the covers." Thomas raised his eyebrows. "That sounds cool. Do you know where it is?" I did. It was sitting on my bookshelf in the Incredible Basement of CRAP, and though I hadn't read it myself in a good 22 years, I knew right where it was, so I went down to the basement to get it for him. ...and then I was in our old house in New Jersey, the farmhouse we had owned and where so many strange things had happened growing up. We were finally moving back to New Hampshire and I was boxing up all my old books, which were sitting in my old low bookshelf in my bedroom. I swear, it was like I was there all over again. I saw myself pulling the Superman book out of the shelf and as I was placing it in a box, I looked up and there, on the wall over my desk, was my old bulletin board. Oh hell, I thought, looking at the photos and newsclippings and county fair ribbons, I forgot to take all my stuff off the board. So I quickly unpinned everything, tossing a few things into the box. But a few things, I slipped into the pages of some of the books. And three items in particular--two yellowing index cards and a photo--I held in my hand for a long while, fretting about what to do, before deciding, Well, if I can't trust Superman to watch over these, who can I trust? I placed them inside and closed the book. "Oh my God!" I screamed, back in the present. Hand trembling, I opened the cover of my Superman book for the first time in 20 years. And out fell two yellowed index cards and a photo of a beaming young man. In a Boston Red Sox cap. Bearing the signature Carlton Fisk. and including a treasure I hadn't had the guts to ask for when I wrote to him, though I SO dearly wanted one--an autographed picture. It was a seminal moment in my life, not just because one of my heroes had deigned to respond to me, but because I came to appreciate the thrill one gets from feeling licensed to seek out a source and ask him questions. I don’t think it's overstating things at all to say that event was what made me decide to become a journalist. The letter and photo together became one of the Great Lost Treasures of my life, though once we moved to New Hampshire, everything got scattered to a wide variety of storage sheds, including one shed where a gang of squirrels broke in and turned several boxes of my papers into so much pulp. After I first posted about my Fisk letter, I conducted the most thorough search of my home and papers, but came up empty. After my parents' death, when I was back in New Hampshire searching for all of my parents' important papers, one of the items BB and I were on high alert for was an envelope containing my Fisk letter. It never turned up, and so at last I had been forced to conclude that it was gone forever. Until Thomas' dream about reading comics under the bedcovers. I ran upstairs, book in one hand, letter and photo in the other, screaming my son's name, and waking the house as I went. That glow of satisfied exhaustion was gone, and in its places was a renewed sense of childlike hope and wonder. The kind one can only feel when one has just finished a week of successful time travel. At one time I had that same photo of Carlton Fisk, lost to the mists of multiple relocations. I still have, given as a high school graduation gift to me by one of my best friends (a Mets fan) a baseball card signed by Dwight Evans. It has followed me around for the last 20 years. Gave me goosebumps--and it's not even an October Moment. Love it! Holy crap!!! you found it!!! This was fantastic. Like you were led downstairs just when you needed to be. Sounds like you and Artlad have been doing a lot of time traveling this week, MM. Good stuff. I have torn apart my stuff looking for old mementos myself more than once. Never seem to turn up when you're looking for them. My letter from Katharine Hepburn fell out of a KH biography/photo book one day long after I thought I'd exhausted everywhere to search in this house. I actually had two copies of the book and was deciding which to give to the library when it fell out. Your post reminded me of a visit to my old high school several years after graduation. I walked through the familiar hallways feeling the same way - like I was in a time warp. I kept expecting to see teachers and old friends, but only saw strangers and my graduation picture on the wall beside hundreds of others. Despite only knowing you through your blog, I think you would be a pretty great teacher. There are many people out there who need somebody like you to inspire them. I think you'd make an awesome teacher and I'm anxious to find out just where this all leads. I'm amazed at the connection between yourself and Artlad. I'm so happy you found the card and shared this event with us. I love having your posts to look forward to again! This one was especially cool. Was Thomas excited about your discovery? Awesome posting. Finding the lost treasures and the dream of a blue flashlight. Amazing! You would/will make a great teacher with all the stories you can tell. Don't you love when stuff like that happens? I love finding my lost treasures! It sounds like Thomas has "the gift" that you were born with. You haven't been exposed to any electromagnetic radiation recently, have you? Could Carlton Fisk be your constant? Gave me goosebumps and a welling of the eyes. That is a GREAT story, and the actual mementos - priceless. I have an autographed photo of Tony Conigliaro that holds a similar place in my heart. He was the first person I ever wrote to, asking for something (the photo) and receiving it. A. How awesome that you found a long-lost memory! I love finding stuff like and I so leave stuff in random places so I can find it in the future...or maybe I leave stuff in random places because I'm disorganized and forgetful? B. Whenever I come home from a trip(or even a long day) my cats pretend as though they don't know who I am but after a short period of time they always want to cuddle and love with me. C. I'm such a dork! I think that's my favourite blog entry of yours ever. Its times like these that I remember why I come back every week. Just so I can remember to smile again. Wow! Can't believe you found it! What are you going to do with it? Give it to Thomas? That is incredible! I LOVE that he signed it 'Pudge'. Thanks so much for the heads up.